Puerto Rico means romance – even with a crowd of Destination Bar Mitzvah kids! Destination: Puerto Rico – Passport free! Your Destination Bar/Bat Mitzvah celebration can take place at one of Puerto Rico’s luxury resorts, or plan a family Caribbean Cruise that sails from South Florida or San Juan to the western or southern Caribbean. A luxury, five-star property, the Ritz-Carlton San Juan perfectly suited to family Bar/Bat Mitzvah groups. Ideally located on eight acres of prime beachfront property in beautiful Isla Verde, and just minutes from historic Old San Juan, The Ritz-Carlton, San Juan Hotel, Spa & Casino offers stunning rooms and suites, five exceptional restaurants, a luxury spa and 24-hour casino. The excellent Ritz Kids program offers a variety of supervised physical and creative activities designed especially for children aged 5-12. Little brothers and sisters won’t be bored! The main island of Puerto Rico is also home to the only authentic Rain Forest in North America.Bar Mitzvah Vacations can arrange a rain forest adventure for your family, including lodging at an Ecolodge or the luxury Condado Plaza resort. And don’t forget: Passports aren’t needed as Puerto Rico is a U.S. territory! Contact Ellen today to learn more about this wonderful Bar/Bat Mitzvah Vacation! Located on Puerto Rico’s southeast coast near the town of Humacao, The Villas at Palmas del Mar is an excellent base for exploring the historic city of San Juan, where you’ll find fabulous shops and cafes as well as renowned forts and casinos. You’ll be close to El Yunque, Puerto Rico’s own rain forest, where you can enjoy stunning natural splendor while hiking or biking. The Villas at Palmas offers a wide selection of accommodation choices, including luxurious 1, 2, and 3-bedroom furnished villas featuring fresh, Caribbean decor, as well European-style suites — all just steps away from soft, sandy beaches. First-class amenities include daily maid services, air conditioning, cable television, and direct-dial telephones. The villas also feature fully equipped kitchens. The Villas at Palmas del Mar: beautiful beaches, superb golf courses, tennis, watersports and villa options that will please family members of all ages. 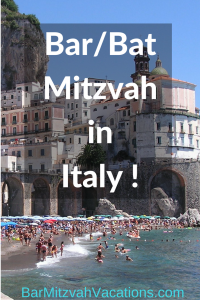 Contact Ellen to learn more about this exciting Bar/Bat Mitzvah Vacation! Your Bar/Bat Mitzvah ceremony will take place at historic Temple Beth Shalom synagogue in San Juan. This synagogue is home to a wonderful multi-ethnic congregation that welcomes Bar/Bat Mitzvah candidates warmly. You are sure to celebrate this important milestone with joy and fellowship at Congregation Beth Shalom. Temple Beth Shalom (TBS), the Reform Jewish Congregation of Puerto Rico, was founded in 1967 by a group of families seeking the warmth and intimacy of a small congregation. Contributing to this ambiance are many off-island associate members, visiting rabbis, and cantors. Contact us for more information on a Puerto Rico Destination Bar/Bat Mitzvah! Parents, grandparents and kids will all appreciate the many features, activities and sights that a Caribbean cruise can offer. Stop off in San Juan and be welcomed into the community of Temple Beth Shalom for your Bar/Bat Mitzvah ceremony. Alternatively, our ‘traveling cantor’ can conduct the beautiful Bar/Bat Mitzvah services in your ship’s onboard chapel. Ellen will gladly discuss the many Caribbean cruise options for you. Your child can perform a Mitzvah by participating in a community service program at a school or non-profit organization in Puerto Rico. Once your Bar/Bat Mitzvah date is set, Bar Mitzvah Vacations will assist with all your plans, including working with synagogue staff to help choose a community service project. 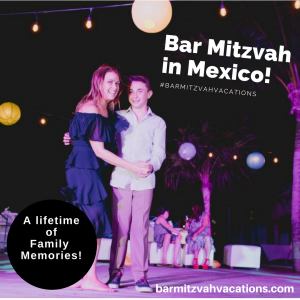 Bar/Bat Mitzvah Vacations will help you fill a treasure chest of memories for your child as well as for family members and friends who share in this important milestone. Dates are available for 2011, 2012, and 2013! Reserve your Bar/Bat Mitzvah Cruise or Vacation now!